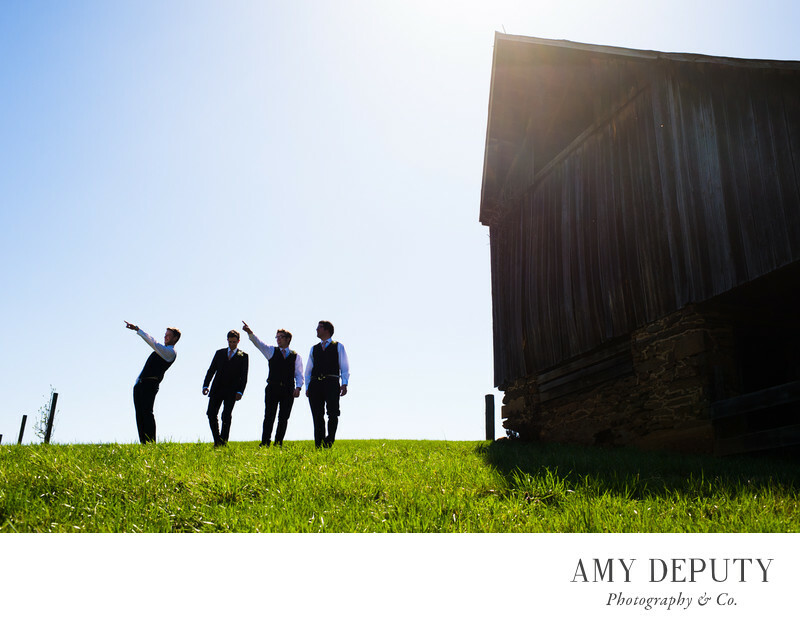 Surrounded by rolling hillside and views of the Blue Ridge Mountains, Early Mountain Vineyards is a spectacular setting for wedding photos. Outside and indoors, this impressive Virginia venue photographs beautifully, adding a lovely backdrop to wedding photos. I've photographed many a joyous occasion along these green acres and look forward to returning again and again. The countryside here, in any season, is magical. In the spring and summer, it's all awash in green from the grasses to the vines to the treetops beyond. In the fall, those trees change their hues, painting the landscape in shades of auburn and gold. Instant ambiance! There is a feel of understated luxury here that is perfect for a wedding ceremony and reception. Its expansive lawn and patio showcase grand views of the countryside and coupled with the property's historic barn, the location is ideal for a rustic wedding. Its Event Hall has a decidedly cozy modern elegance of an upscale lodge, with its slate gray flooring, off-white painted brick walls, and wide fireplace. Early Mountain Vineyards tops my list as one of the best wedding venues in Virginia. It truly has it all — beautiful countryside, elegant setting, and great people. Oh and the wine! Location: Early Mountain Vineyards: 6109 Wolftown-Hood Rd, Madison, VA 22727.